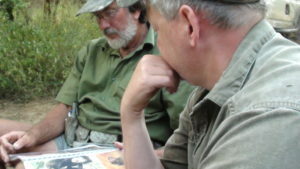 You are here: Home / African Safari Hunting Information / What is a typical day on safari? What is a typical day on an African safari? After you have determined where to go and what you’re going to bring, people like to know what a “day in the bush” is going to be like. Do we get up before dark? Will I get breakfast? Do they have coffee? Will it be cold? All of these are very good questions! While each location is a bit different in exact routine, here are some typical guidelines regarding normal routines in camp. On the first day, you will bring your rifles to a sighting in area to ensure the sights are still aligned and the shots go where you intend them to. It is usually not possible to make repairs in camp if travel and rough handling have damaged your rifles telescope; therefore, we suggest to have either a backup scope (already sighted in and secured in your luggage) or back up iron sights. Be sure to have the small tools to change the scope out if needed. I also recommend bringing extra sighting-in targets and enough extra ammo to account for such a situation. Forewarned is forearmed. Once you have your rifle sighted in you are ready to begin hunting. Depending on when you arrive in camp you may start hunting right away, or if its late afternoon, you may just go for an orientation drive in the 4×4. particulars of proper shot placement on some of your desired species. This is very important and you should pay close attention – your PH wants you to have a good time but he is also depending on you to do your best as a hunter. Both of your lives may depend on your shooting skill and experience as a hunter. A day of hunting in Africa normally involves driving in the 4×4 vehicle to the hunting area and then pursuing game on foot either by spot and stalk, or by following tracks. This is a general guideline! Depending on what species you are hunting will dictate the approach in your area. Hunting practice and conditions will also depend on the hunter’s physical ability and local wildlife conservation hunting rules. In most locations, hunting may begin as soon as its light enough to see and cease at dusk. 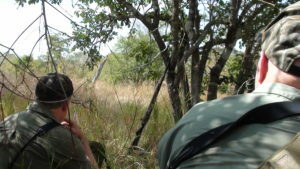 While out hunting, you will have the company of your PH and also may be accompanied by trackers or in some countries a game scout from the wildlife conservation office. If you are successful and harvest some game – congratulations! At this time the PH will arrange to help take some photos with your trophy in the field, and then load the vehicle with your trophy. Normally this would then be taken back to camp as soon as practical for skinning and preparation for taxidermy. Wakeup call: When it’s time to get up, someone will knock on your tent/chalais door and let you know. Depending on location, this could include a tempting cup of coffee or tea. Breakfast: The type of breakfast you get may depend on what you are hunting – if the species you are hunting comes to water or is on the move early, you may be getting a quick piece of toast and a cup of coffee and heading out to the hunting grounds. Otherwise, you can safely assume a full breakfast with most any typical breakfast foods available. Mid-day: In most cases, the camp will provide a cooler with sandwiches and cool drinks to take on the 4×4. When there is a break in the hunting you will take a lunch break (and maybe even a short nap). Dinner: When back in camp dinner will be prepared by the chef (or PH if you are in a fly tent remote camp) along with drinks. You can expect a full but usually not elaborate meal consisting of either locally sourced meats and if you are a successful hunter, some of the choice cuts from your trophy. After dinner: This time is usually spent around the campfire with a cold drink and is some of the best times in Africa. In many cases, people will want to go to bed shortly after dinner as they are typically quite tired from all the excitement and fresh air and trekking. I remember on one occasion, another hunter and I had to literally carry one of our young (pre-teen) hunters to the chalet each night as they would absolutely pass out at the dinner table from exhaustion. Arrival: Most camps are serviced by local roadways unless you are advised to arrive by charter aircraft or boat to an exceptionally remote camp. Sleeping quarters: Most camps have chalet accommodations for hunters or in some cases Luxury tents. Some camps that are very remote are fly tent and more primitive. In almost all cases you will have separate sleeping quarters for yourself (or with a friend if you are hunting 2×1). Bathrooms: Most locations will have private ensuite bath and shower in your tent or chalais. In some cases, in remote camps you may encounter a communal shower and bathroom, but these are less common. Even in remote locations there is normally plenty of hot water either through Rhodesian wood fired boilers or a gas fired water heater. Laundry: You usually don’t have to bring a lot of extra clothing to Africa as laundry is done in camp every day. You can usually manage even with 3 days of clothes unless you are hunting in the Winter months (remember- Winter in Southern Africa is opposite of ours – the coldest months are July and August). Always remember to have a jacket and rain gear and extra socks. Depending on location it may be cool in the morning and evening – even if quite warm day time. Communication: In most areas, these days unless you are very, very remote you may have mobile phone signal. Some camps have wi-fi and internet some don’t. If being out of touch is difficult for you it is possible to rent a satellite phone. You can also check with your mobile provider and purchase a short-term plan for the duration of your trip. Be careful on sending and receiving SMS / Text. These charges can add up in a hurry! This may be especially important if you are travelling with adolescent children that are very connected to their mobile devices!